THE PLACE THE "IMPOSSIBLE DREAM' WAS REALISED. One reason JOA was awarded this project, in the USA, was spoken by one of the members of the Board. He said: "They were the only one of the Architects who had an idea of what to do with the interior". To a non-Architect, this may not seem a very momentous remark. To an Architect of my generation, it can be set next to the conviction, expressed to me in 1959, by my Tutor, Peter Smithson, the most revered Architect of his time, that: "In Modernism, a great interior is impossible". A quick way of grasping what has happened in this building is to register the fact that it is the largest new building on this 100-year old Campus. It stands next to its oldest building, one of Houston's most revered architectural monuments. Lovett Hall hosted the G8 Heads of State Summit Conference of 1990. 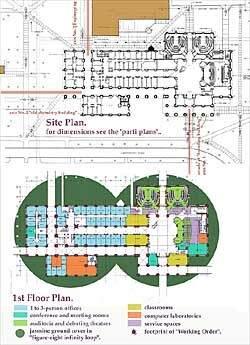 The American Institute of Architects decreed, in the late 1970's, that Rice University Campus, and Louis Kahn's Kimbell Museum, were the two structures, in the whole State of Texas, of "great design quality". So when our addition to this Campus, in its most critical part, was completed and greeted with enthusiasm by the 'Town and Gown' of Houston, JOA were extremely relieved. 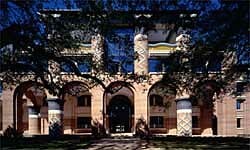 Duncan Hall is now included within the itinerary of visitors interested in Houston's art and architecture.This is not only because it is next to Lovett. Even more surprising than this success was the fact that the sole and only principled, solid and, we can even say, fanatical, opposition to the new building came from Rice's own Faculty of Architecture, whose Professors, almost to a man, refused to enter the building. Their students were similarly prohibited. It soon became clear to me that what had happened was that the Public liked Duncan Hall because they found that it was everything a building ought to be - and even more. It rambled yet was orderly. It had big columns and capitals, yet was not a 'period piece'. It had big public spaces, yet these were both formal and informal. Above all they were grand and colourful. People felt uplifted, yet they also felt at home, awe-struck, but not 'frozen-out. The building was modern, yet also traditional. In short it seemed to be all things to all men. It was everything that a normal person might expect a new building to be. By 'Public', here, I mean everyone, including the highly literate and educated public of Rice's Professors of Humanities, Sciences and Engineering. University Professors, as well as undergraduates, tend to speak their mind, and I was constantly beset by expressions of gratitude as I busied myself, after the opening, in photographing the building. So why, amongst all this unforced happiness, were the Architectural Academics so absolutely negative? Had JOA merely tricked and bamboozled an ill-informed public of 'amateurs'? No, the reason why my own colleagues (everywhere) have such difficulty with the achievments of JOA is that they, and I include here the best informed and architecturally educated of them, know that what we have done, and done especially at Duncan Hall (where JOA have best succeded in fulfilling our project) is "impossible". Indeed it is not only 'impossible', it is also 'wrong' - in some narrowly 'Architectural' sense of what is moral and ethical. The whole of 20C Architecture, from its earliest beginnings in Vienna, Prague and Rotterdam was founded on the idea that 'tradition' was the enemy of progress. Everyting inherited from the past had to be discarded. Architecture had to learn from any industry, any technology, and any art except its own. 'History' was absolutely taboo. In the 1960's this prohibition was lifted. 'Post Modern' Architecture, led by the Venturis, was the result. It is held, by architects, today, to have run its course. In short to have 'failed'. In fact it did fail.. The reason for this was that it was not sufficiently radical. It was not serious enough about the 'tradition' to entirely decipher it, as we have in JOA. The first half of the 20C worked with the assumption that tradition had to be abandoned, and a new Architecture invented that owed absolutely nothing to precedent. The second was not so sure, but still held to the idea that it was impossible to invent a 'new' Architecture that could follow the rules of tradition, and still be adequate to the task of providing the novel soluitons required by today. History has proved 20C Modernism wrong on the first count. It has proved impossible to invent a New Architecture that can perform the functions of the traditional ones. The main proof of this failure is the state of the urbane lifespace. Contemporary technique has no way of creating a workable alternative to the traditional methods. Every 'radical initiative' merely destroys more of what cities we have remaining and makes matters worse. JOA have proved mainstream Modernism, including Post-Modernism, wrong on the second count. We have proved that it is possible to modernise the architectural tradition so that it performs all of the operations and functions performed by the techniques employed during the history of this Medium - but in a way that serves the functions of this, our own time. In JOA, over 40 years, has so 'deconstructed' the Tradition as to enable us to reconstruct it as an new architectural technique. We call this, so as to compare it to the Architectural Orders of the tradition, a 'Working Order'. As with all new ideas that really work, it is a very simple set of notions. Yet a complex chain of thinking and working lies behind these recipes for progress in Architecture. This web-site is the first time that this structure of ideas is made public, or is beginning to be made public, for it has only been 'in Cyberspace' since December 1999, and there is much more to the 'Working Order, than is here yet revealed. 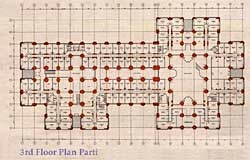 The almost total enthusiasm shown by the Public for Duncan Hall placed the Architectural Professors in an impossible position. What could they say to their Freshmen? Should they admit that everything they were teaching was now overturned and superseded, before, as it were, their very eyes? Can one imagine anything more disturbing to the already fragile sense of reality of the embattled Professor of Architecture in the USA, a country once gloriously replete with wonderful late 19C, and early 20C, buildings but now with its Profession and Architectural Culture in headlong retreat before forces that, in the recent words of a Director of Stanhope's, Britain's premier firm of Project Managers " will see the extinction of the Architectural Profession within 15 years". Well, the Professors could at least have said, "Lets get hold of this Outram fellow and give him a good intellectual third degree". "Find out what makes him tick and where he gets his ideas from". "At best we will find they are all rubbish". "At worst (a normal person, like a non-architect might reverse this valuation!) we will find out that there is something to them (and this will give Rice an advantage, if they really are 'so new')". But no, the proof that the Professors were, underneath it all, terrified that their pedagogy had been undermined (as ideas tend to be) by novel events, was that they ran away. They refused me even the pleasure of explaining my building to their students. A member of my staff, David Bass, more academically qualified than I, had to lecture the Rice Architectural students on JOA's behalf! Ignorance is never an attractive thing. Ignorance imposed by people who should know better, upon their less knowledgeable charges, is an evil thing. Reading this website, and especially the essays devoted to 'Duncanology' will lead the Students of Rice Architectural Faculty to understand that their Professors denied them first- hand access to the process, all five long years of it, during which these ideas were laboured over, minutely examined, and finally, and triumphantly, proved in every single department of functionality, just a stone's throw from their own Dean's office. They could have had JOA for free. Today it will cost them $5,000 for a lecture. But then, better still, there is now the JOA Website that they can explore, free of any tabu. 2: The "Working Order" takes a quantum leap forward, becoming with the addition of the "Walking Order" , a tripartite system of the Vitruvian model (see also FAQ #1. "Has any Critic ever 'named' your Style?"). 3: We achieve a comprehensive "Scripted Surface" design for the first time. (see also "Duncanology" Part 4, the "Empire of the forest",the "Raft of fire - Mountain of Water",and the four techniques of "Blitzcrete ",of "Doodlecrete",of "Video Masonry",and of "Video-Secco" together with FAQ #4. "Why are your buildings so colourful and so highly decorated?"). In 1968 Rice was awarded a National Science Foundation grant to house the Center for Research on Parallel Computation. Over the years CPRC, together with the Computational and Applied Mathematics department, outgrew the accommodation available. 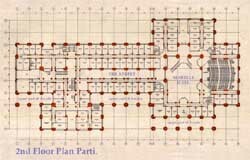 In March '93, the Board approved a project for a 60,000 sq.ft net new building to house these departments, together with the Computer and Information Technology Institute, the Electrical and Computer Engineering Department and the offices of the Dean of Engineering. This was to be located on the site of a single storey laboratory built in the 60's situated in the oldest part of the campus framing the Northern side of Founder's Court and right next to Lovett Hall, the oldest building on the University and the site of the 1990-G8 Conference. JOA were selected from approaches made to 100 different firms, followed by a reply, in essay form, designed to test our approach to the Campus and the Brief, and an in-depth interview with the Board. Duncan Hall represents the highest point yet reached (as of March 2000) of 25 years of research, building and proving of ideas that were, as recently as 1995, judged "Immensely ambitous and, many would say, impossible....." (Bob Maxwell, Dean Emeritus of Princeton Faculty of Architecture). It is to the credit (and I would add, material advantage, of Rice) that the strong-minded pursuit of an undeviating architectural ambition, free of cant and fashionable fads, enabled JOA to prove that the ideas we pursued had a huge and entirely practical application, covering as they did a 'decipherment' of the whole Campus, the installation of Houston's biggest 'Work of Art' and the proving an 'Architectural Order' that for the first time in the 10,000 year-old history of this Item, central to all large scale compositions, combines all of Vitruvius's three functions on one and the same ground footprint. It may be thought that these achievements are only possible because Rice is a relatively wealthy university, and can hire Architects from Europe. Let me say first of all that Duncan Hall cost 10% the cost of Lloyds of London. Yes, @ $133/sq.ft, this is 1/10th the cost per sq. ft. of Lloyds. Well, all right,Lloyds of London was ridiculously costly! But is it ten times better than Duncan Hall?. It is true that one must pay for air fares from Europe and hotel rooms but, well, then this is really the only extra. The JOA Consultant Team's extra telephone, Fedex, travel and hotel expenses came to 0.83% of the total, inclusive, project cost, excluding land and finance costs. This is not a big factor when compared to the huge variations in building costs that some design strategies entail. A BUILDING THAT WILL NOT NEED TO BE DEMOLISHED. The reason why the Bonner Nuclear Physics Laboratory was relatively easy to demolish was that it was a very 20C building. By this I mean that it was building which was closely tailored to only one use. 20C Architectural theorists misled the Public by preaching that buildings should be closely fitted to their function. 20C Architects used this argument to 'prove' that all old buildings were dysfunctional. How could they be efficient when functions, and users, constantly changed? All old buildings, therefore, had to be demolished. It was a wonderfully self-fulfilling prophecy, creating a huge amount of work for everyone. Also the new buildings were only designed to last for 15 years. For this is the time it takes for lifts and other machinery to require a major overhaul. The Tax Regime in L.A. allows buildings to be written off, or amortised, in 15 years. It takes 200 years to 'write down' their capital cost against tax in Switzerland. Nothing could be renewed or maintained in this building stock of the late 20C. None of it was designed to improve with age. Fashion was accentuated, so that after 15 years an extreme 'fashion statement' would seem 'passé'. Owners would want to demolish because of the physical state, and the ugliness, and to take advantage of a fresh 'amortisation opportunity'. Our approach in JOA is to take the opposite approach. An economy which rebuilds its main buildings every 15 years is shockingly wasteful of physical resources. It creates a human lifespace polluted with trivial fashions and made of scrappy, cheap materials. There is nothing to do in such places except constantly keep moving, working, and putting up and tearing down worthless temporary structures. It condemns its inhabitants to a labour of Sisyphys whose ultimate outcome is the rapid degradation and devaluaiton of land. What we have done, by researching deep into the history of Architecture, is to invent an entirely new kind of generic, typical or 'canonic' building. This sort of building is designed to create an internal 'landscape' which is suited to a very wide range of typical functions. Duncan Hall has at least twelve radically different kinds of working and socialising space inside it. Together these add up the phenomenon we call the "Republic of the Valley"®. We fine tune these twelve varieties by nothing as trivial as arbitrarily varying their shape (which seems the preferred recipe today). Instead JOA 'design in' these spaces with huge walk-in "Working Order"® service ducts. Engineers can bring any kind of service, within this cubic lattice of hollow columns and beams, from drainage to gases, lighting, air, and, even, fitted showers. 'Function' is increasingly mediated, today, by instruments and machines. Why fight it? We just accommodate it and, with it, revalidate 'monumental' architecture. Why not design an Art Gallery like this? With Robot Columns as 'light pipes'? We design laboratories like this. Chemists like to work hard and then have fun. They are human too. Fine Art, today is like a laboratory experiment. It has no direct application to the everyday world. 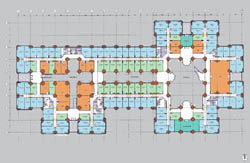 By installing our first big Canonic Architecture Building onto Rice, which was already a Canonic Campus Architecture (see "Duncanology Parts Two: "Claude's Key" and Three: "Cram's Campus"), JOA have put down a marker as to what can be considered a 'Canonic Lifespace Design' strategy. 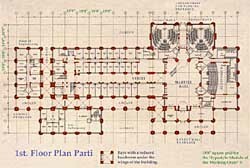 The building advances the system of two/ three storey quadrangles and linking arcades first established by the original campus plan of Cram and Goodhue. The main entrance is aligned onto the Lovett Hall arcade. The Students Entrance is aligned with Butcher Hall, the early 20C Chemistry Building. The Engineering Quad entrance is aligned with the side of Abercrombie Hall. Although the whole building is ordered by a simple 2:1 Module it has been very precisely adjusted to its site. It uses the JOA "Skin Architecture" technologies of coloured bricks and inlaid concretes, adapting these so that the building sits next to Lovett hall, the oldest and most beautiful building on Campus. 'Outreach' functions comprising a 230 seat auditorium, two 80-seat lecture theatres, and five seminar rooms are clustered around the 54 feet high Martell Hall. This "city square", and its rooms, can be used for Continuing Studies courses in the evenings without compromising the security of the rest of the building. It has become one of the two preferred complexes for hosting major social events, from the Founder's Dinner, to Major National and International Conferences, to the annual Engineering Schools paper dart design rally. The building houses some 250 offices. The need to cluster the offices into research groups was satisfied by arranging the building into a "main valley", known as the Street, with five "tributaries", interlinked by "goat-paths" and "seminar bridges". Each tributary serves a group of "hermits caves", on up to three floors joined by a "waterfall" "social-stair". They share common resources such as laboratories, coffee, printing facilities and an external balcony for "al fresco" classes and meetings. Workers engaged upon original research must be allowed to spend substantial periods alone, in their caves, in front of the flickering light of the Cathode Ray Tube. Their workgroup is either small, or chosen from collaborators whom they choose to contact electronically. Both Research Institutes insisted on a form of "Openworking" (public) space which project-groups could occupy for some hours in end. These were to encourage groups to interact with each other informally. It was also to allow the "hermits' caves" to remain private, while permitting the Director of the Institute to engage informally when the Group Leader decided it was time to "hit the street"..
Comfortably furnished "Outworking" areas are provided at places where people are likely to meet, some as "seminar boxes" some as "seminar bridges", and some as "corner shops". The floors in Duncan Hall are only 11'0", from floor to floor. This is 1'9" less than they would have been if the air conditining machines had been in the ceilings, and not in the "Robot" columns". This means that the valley-clusters work as vertical communities because people use the stairs. People stay healthier.They see each other and stop and talk, making a more effective Institute all round. All offices have their own air conditioning unit with a thermostat and fan speed control, housed in a 'robot column'. The units can be ganged together for scheduling from the university's central plant. 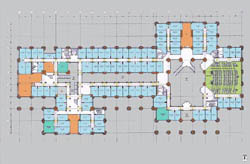 This approach eliminates most of the ductwork and reduced the four-storey building's height, overall, by six feet. It also permitted the use of non-Teflon jacketed networking cable throughout. Each office has plenty of power points and netwok connection points. Over 100 miles of category 5+ twisted-pair cable and over 13 miles of fiber optic cable were installed in the robot beams and robot columns. Lighting generally is double switched to provide both high and low levels of illumination. Fundemental to the understanding of the project is the idea of an idealised but obscured perfect building, or 'temple'. The Clearstorey level reveals the long march of columns through a grand space that resembles a Gothic cathedral, whilst below this level the grand structure has been colonised with a horde of small rooms on either side of the "Republic of the Valley®" . The columns are located on a regular grid, or 'hypostyle'. Where columns are not required on the grid, a 'scar' is usually apparant on the floor. Off the nave are four wings, or chancels, in the shape of two greek crosses of unequal size. Leaving the clearstorey open creates a space that suggests the larger, grander structure to the observant mind. Just as the nature of the interior is hidden from view, so too is the exterior. The building is embedded into a site that is rich with trees and other buildings. Most views of the building show it peeking through the trees. It is difficult to discern either its size or shape until one is quite close. The same effect can be seen in Rome, where ancient buildings are hidden in and under more recent structures. The roof of red pantiles harmonises with the rest of the campus. It can be seen as an 'ark' -or 'raft' of ideas that has come to rest upon the buildings columns, with their decorated capitals. The runs of brick are separated by wide mortar joints, leading a softness to the building's appearance, and, in keeping with Rice's traditional use of decorative and symbolic patterns in concrete and brickwork, the bricks were selected in four colours and laid to portray geological strata. Glazed brick in blue-green and white frame the exterior balconies at each of the building's four wings and depict the four platonic elements and four ancient civilizations in which they were represented. Snaked around, and cutting through the building is a wide arcade which links Lovatt Hall to the Engineering Quadrangle. Occupied interior space encroaches on its height in each wing, taking it down to a single storey in height. It cuts through the southwest wing, creating the physically separate space for the undergraduate computer labs. Similarly it cuts north through the west wing to isolate the Dean of Engineering's offices (located at the entrance to the Engineering Quad.) from the central body of the building. The north-south portion of the arcade lines up with the front of Abercrombie Laboratory to accommodate a planned arcade extension that would connect the buildings at both ground and upper levels. At its western extremity, the arcade aligns with the front of the Chemistry Building. The front of the arcade is lined with Rice's deep brick arches. The interior is constructed largely of inexpensive, manufactured materials. The walls are sheetrock and cast gypsum. The structural concrete is exposed in many places. The ceiling is a simple lay in accoustical tile set at a forty-five degree angle. The ballustrade rails are made from steel pipe. The only 'natural' material found in any quantity is the wood of the doors. Both shape and colour is used to dress up the interior and imbue these inexpensive materials with a meaning, and colour is used to make your eye "read" the curves and twists of the interior. Each floor has a characteristic colour. The public areas at ground level are floored with a hard wearing patterned terrazzo in five colours, its large scale composition depicting the "river valley" whilst being superimposed with the grid of the hypostyle. The Main Hall features a unique 'painted' (but in fact printed) vaulted Shaper ceiling which encodes a myth entitled "The Birth of Consciousness". The ceiling pioneers a new technique for decorating surfaces called "Video Secco" or Scripted Space", and draws on the latest developments in Desktop Publishing and large format printing - it is printed on easily cleaned vinyl wrapped around accoustic ceiling tiles and took just two days to erect. Duncan Hall features a way of organising Research workspaces to embody a "Republic of the Valley®" between them. This tiered "valley" gives an Institution a "natural" space in which to 'embody' its society, and hence a 'green' foundation..
1. is in the centre of a beautiful campus (itself originally planned as a 'river valley'). 2. introduces "synthetic masonry" such as "Blitzcrete" and "Doodlecrete" to Architecture of the highest quality, avoiding the need to use high quality natural cladding materials. 3. keeps its rooms well day-lit. 4. aims to minimise A/C by making large rooms very high and a using solid roof over the central atrium. Projecting surrounds reduce solar gain through windows. Offers users control over their individual spaces. 5. maximises the use of stairs, which is beneficial for health, by keeping floor to floor heights (8'6") very low indeed. 6. uses no propped floors or suspended ceilings, exposing the thermal mass of the concrete floors. 7. Creates a new kind of "landscaped" work-space for the computerised work culture. 8. Introduces radically new ways of organising building services and architecture: the Robot Column and the Robot Beam, which simplify maintenance and 'cost in use'. Working Drawings commenced: July 1994. Donors: Over 160 named individuals, trusts and organisations. Architect of Record: Kendall Heaton Associates, Inc. Structural and Civil Engineering: Walter P. Moore & Associates, Inc.. Mechanical and Electrical engineering: I.A.Naman & Associates, Inc.
Data Cabling & Networking: COMSUL, Ltd.
Landscape design Consultants: Sasaki & Associates. Main Contractors: Lott Builders, Brown & Root.